Microblading is a manual, semi-permanent method that yields natural, crisp strokes that resembles hair to form & shape eyebrows. A 50% deposit will be required at the time of scheduling. 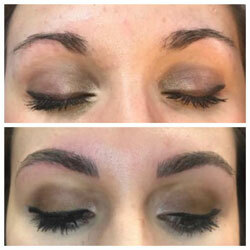 Permanent Cosmetics can enhance your appearance. It can improve thin or no eyebrows and give you eyeliner that never smudges or washes away. 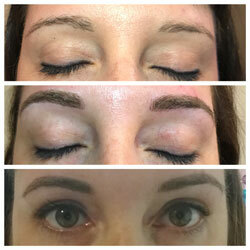 All permanent cosmetic services require a consultation prior to scheduling the service. -Define lips by adding even the slightest amount of permanent lip color. Have perfectly curled lashes & the freedom from the daily task of using lash curlers. 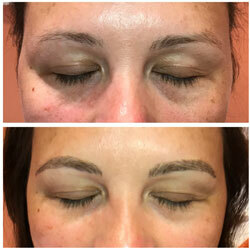 This is a semi-permanent treatment that lasts up to 3 months. We offer our clients more than just beautiful lashes. Our mission is to provide each client with a low maintenance beauty routine, a simplified lifestyle and a new definition of confidence. The application process is very relaxing - like receiving a spa service. You lie down on a plush table and have your eyes closed the entire time. Your technician will glue one synthetic lash extension to one of your natural lashes with medical grade glue. When your natural lash sheds, the extension will fall out with that lash. To maintain a full appearance, it is recommended to get a refill every 2-3 weeks. Your initial full set takes around 90 minutes, and refills can be done in as little as 45 minutes. First time spa experience or just your first time with us? Not sure how things work or what to expect? No problem! Let us lend you a guiding hand with this simple list.